I was watching the excellent documentary Historien om Danmark and they basically said Denmark (and Scandinavia as a whole) was pretty much isolated until Viking Age starting in late 8th century (Period: 800 AD – 1066). I was very curious about this: despite the relatively short distances and the fact of being close to Germans and other northern European nations that could be reached by land, basically they traveled by sea, with little contact with neighboring countries. Also, before the Viking Age in VIII Century, they could have attacked what is now Germany (they did, but I mean extensively), Poland, Belgium, Holland and even Lithuania and France, traveling near the coast, which is much safer. However, they invaded Scotland and England (which are much further away), traveled to Iceland, Greenland and even North America, with many risks. On the other hand, the "benefits of civilization" also came to Denmark much later than the rest of Europe, prolonging the Iron Age for centuries in what became known as the Germanic Iron Age and Migration Period. Maybe it's possible that dangers that Danish people might perceive were also perceived by other nations. Or simply other peoples did not want to trade or have dealings with them. Anyway, my question is: Why did they choose this much riskier path when they could have chosen much safer paths? And why were they so isolated from the rest of Europe until the Viking age? Note: I'm taking "Danish people" to mean people that lived in Denmark. England was by no means "much" further away from France. The Strait of Dover is only 33.3km away from France at the closest. You can see Calais atop the White Cliffs, and vice versa. So even if it was appreciably more dangerous to sail across the North Sea, such a journey could be avoided by simply taking a short hop from France. And in fact, the Anglo-Saxon settlement of Britain began in the Southeastern England. Eopwinesfleot , in Kent, is preserved in chronicles as the site where Hengist and Horsa first landed in Britain. More concretely, East Anglia is generally regarded to be the first to be settled by the Anglo-Saxons. Both locations are within easy distance from continental coast. Scotland . . . Iceland, Greenland and even North America, with many risks. Except for the Scottish Lowlands, all of these only occurred during the Viking Age. The settlement of Iceland only began in the mid-9th century, and Greenland and America even later than that. While parts of Scotland fell under the control of the Anglo-Saxons, that was the result of the Northumbrians expanding northward, and thus has nothing to do with the perils of sea travel. And why were they so isolated from the rest of Europe until the Viking age? This is actually not true. Even in antiquity several Germanic tribes are thought to have moved out of Denmark into the rest of Europe. For example, the Teutones, the Cimbri, and the Ambrones were said to be neighbouring tribes from what is now Denmark. Their arrival in the territories of the Roman Republic sparked the Cimbrian War. It is probable that shorter distance migrations into Germany would've been more common in the same period. Furthermore, during the late empire, several more tribes hailing from Denmark featured in the Migration Period. In addition to the Jutes and Angles, this includes the Burgundians who are thought to have originated in the Danish island of Bornholm, the Herules who may have been driven out of Denmark by the Danes. This is in addition to the tribes that inhabited Scania, which until the modern period were considered Denmark and were reckoned as such in the Viking Age, such as the Lombards. Thus while the Jutes and the Angles were colonising Britain, their neighbours the Burgundians were settling in Eastern France and the Lombards were conquering Italy. 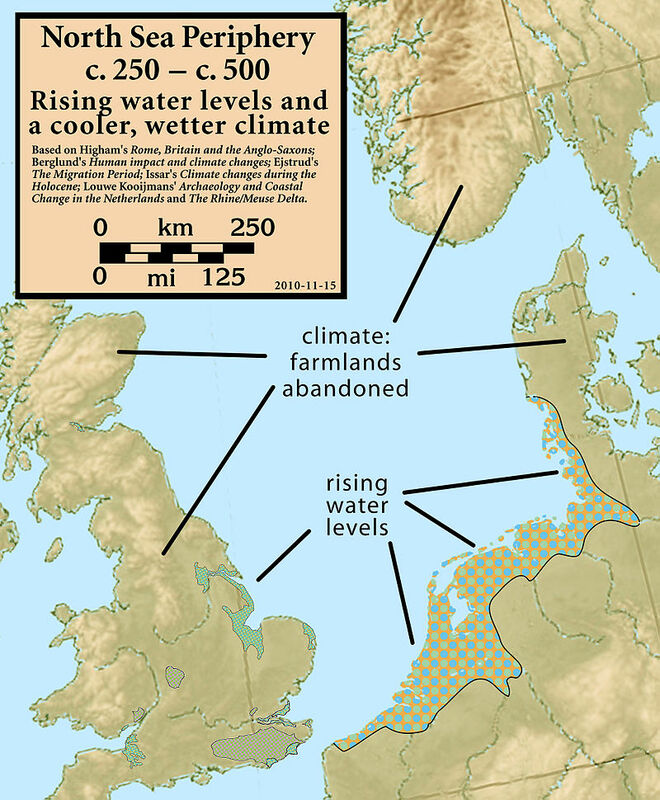 One of the impetus behind the Angles migration is a deterioration of climate conditions during the late classical period. This led to severe floods of the Jutland Peninsula as well as the German North Seas coast - including the lands of the Saxons and the Frisii. Hence, the reason the Angles (and Saxons) headed for England was as simple as that there was a relative abundance of land in England. The Roman withdrawal had also left it undefended, unlike France and Belgium where the Franks had settled. A few answers have pointed out the relative ease that you can get to England, so I won't go that route with this answer. I'll go with wealth and militancy, along with some revenge. England could be recognized as an easier conquest during this time frame, repeated war and intervention from a variety of sources left England relatively weak to foreign invasion. Æthelred and several 'pre-england' kings paid massive ransoms to the Danish (referred to as 'Danegold'), the isle was truly ripe for the pickings and they had the wealth to pick. Reversely, much of the Germanic tribes to the south were much more nomadic and lacked the wealth to pay such ransoms. There is also some politics involved here. Francia was the frankish nation within Europe and at it's hieght under Charlemagne had occupied everything in now current day France, to Italy, and Germany. They had defeated superior foes such as the Umayyad Caliphate and would put up tough resistance to invaders. Ragnar Lodbrok invaded Francia and had general success, but eventually made his way up to England after some tribute and military stalemates (Siege of Paris (885–86)). King Ælla of Northumbria captured and killed Ragnar (pit of snakes is the legend). In the name of revenge, The Great Heathen Army (mostly Danish Vikings) attacked England and would eventually settle there. Oddly, this revenge over the killing of Ragnar by an pre-English king was likely a good reason they hit England as hard as they did. Poland - This wasn't an easy target like you suggest...home to the Goths, a semi-nomadic people that were extremely warrior like, would put up a big fight and present little wealth to the victors. Scythia - There is much lost history here, but if you go into lithuania and further south, you find the Scythian peoples. http://our-russia.com/1466750716/expedition-kyzyl-%E2%80%93-kuragino-lost-tribes-and-origins These were also a nomadic people with not as much wealth to plunder, but also a heavily warlike people that gave rise to the legendary Amazon warriors. Considered by many (Roman/Greek sources) to be warriors without equals (from the link ""No invader who comes against the Scythians can ever escape and none can catch them if they do not wish to be caught.“ – Herodotus"). To get to any real wealth, one would have to venture as far south as Byzantine and Constantinople (which the Swedish vikings did, becoming the Varangian guard). Why did they choose this much riskier path when they could have chosen much safer paths? A bit of a mix of the other paths having little wealth but great resistance, and a little bit of revenge. Before 450, Denmark was inhabited by the Saxons, Angles, and Jutes (from south to north). Geographically, the Jutes especially were the predecessors of the Danes. In the migration period, these three tribes left for Britain. Rome had abandoned Britain due to deteriorating conditions, which created a power vacuum. The Angles settled in Northeast Britain, the Jutes in southeast, and the Saxons in central and south Britain. The Jutes by far fared the best. Their territory became Kent, absorbed other Saxon kingdoms, married with the Merovingians. They became the first Bretwaldas. It's also notable that the Saxons may have been invited to Britain as mercenaries. After this migration period, we hear about the Danes in "Juteland". They were a distinct group of Norse who were related to the Swedes. They were especially freedom loving, hostile, and made up a large part of the Vikings. They were also some of the last of the Norsemen to convert to Christianity. Before the Saxons migrated to England, they tried to settle in Gaul*. They were repelled by the Franks, who were allies of Rome. They managed to stay in Angers until being defeated by Chilperic in 469 (Haywood 86-7). The settlement of the Visigoths by Romans may have been in part against Saxons (Haywood, 88). In the 600s, Germanic Frisians took Dorestad on the lower Rhine. This probably contributed to the decline of the Merovingians (Haywood, 126). When the Frisii were kicked out of Dorestad, they took up pirating. Germanic pirates acted like their Viking sucessors. This included occupying an island at the mouth of a major river, which was an ideal base for piracy. The new Germanic migrants had become a part of the sea. The sea was safer than mainland Europe. Just because Scandinavia was outside the reach of Roman Christianity (until Charlemagne), doesn't mean it was a wilderness. The Baltic Sea represented its own political sphere, like the Mediterranean. If it was really a wilderness, powerful war like tribes would not have emanated from it at regular intervals. The amber road had been active for Millennia, as well as numerous trade routes across Europe. Still, people tend not to migrate unless they are under pressure. Swedes did not directly follow the path of their German predecessors because from around 200 A.D., Germans had been developing sea power. They did try to make inroads into Europe, but were blocked by Franks and Goths. Still, the Frisii and Saxons had continental territories until Charlemagne. The first Swedish kingdom also formed around 750. This was also around the time that the Rus became a major force on the Dneiper river. These first Swedish kings were also the first kings of Norway c. 900. From about 750-1000, Scandinavia was full of tribal warfare and fledgling kingdoms. It just so happens that that 750 is about the time that Vikings appear in Western Europe. I haven't seen it mentioned, but it appears that the settlers were an effect of the state building of Scandinavia, 750-900. The inherent independence of the Baltic trade is later evidenced by the Hanseatic League. *I'm pretty sure this is in Haywood. I don't have it in front of me, and its not in my notes. Not the answer you're looking for? Browse other questions tagged ancient-history vikings early-medieval scandinavia or ask your own question. Why is Kubb - a skittles game - associated with the Viking Age? Why were Germanic languages able to spread over much of northern Europe after 500BC? Did they mostly replace Celtic? Why did some ancient societies make human sacrifices but others did not? How did people put down a drinking horn? How did people first discover that food is food?